Frames: state of the art was published in 2008 to accompany the exhibition of the same name at the Statens Museum for Kunst in Copenhagen. The guiding spirit behind both was Henrik Bjerre; he is generously allowing The Frame Blog to republish essays from the book, which will appear as an occasional series. The second essay in the series is by Henrik Bjerre, and deals with frames in the Royal collections of Copenhagen. The Royal collections in Copenhagen are among the oldest in the world, from the point of view of continuity, with their roots in the 16th century. However, very few surviving frames in the present Statens Museum for Kunst date back to this period. If one wanders through the rooms of the Museum today and catches sight of a Renaissance or Baroque frame, it would be exceptional if its history could be traced back to the original Royal collection. Many of the best frames have arrived in more recent times, typically in the shape of a new acquisition: that is to say, after the establishment of the Museum in Sølvgade just over a hundred years ago; whilst almost all the frames in the old collections which are larger than about one-&-a-half by two metres are copies from the 19th and 20th centuries. The history of the frames in the Museum is in general chequered, having been – like the art collection – affected over the centuries by catastrophes and periods of neglect and impoverishment. But these factors have been partly offset by positive initiatives, especially in more recent times. It should be stated from the outset that knowledge of the collection of frames in the Royal context is mostly guesswork, as information about it has only on very rare occasions been handed down, in spite of the fact that it has undergone great changes over the course of time. There were a number of major and appalling palace fires; pictures were cut out of their frames, which then perished. We can also find accounts of decay and various forms of degradation in the collections going back as far as the 17th century. Other influential factors include changing styles, which reached provincial Denmark rather belatedly compared with fashions further south in Europe. This can mean that as the collections were replenished, efforts to harmonize the various stylistic groups were made by replacing old frames with uniform new ones. It is worth remembering that many of the large paintings which were purchased by various monarchs to decorate the Palaces of Copenhagen, Frederiksborg and Rosenborg – for example, the so-called Rosenborg series, now hanging in Kronborg Castle – may not have had carved wooden frames in the beginning, but were instead inserted in a fixed framework of stucco in the walls or ceilings. An exquisite example of a complete surviving programme of decoration with integral wall frames in the Danish Royal collections is the arrangement in the Winter Room at Rosenborg, dating from c.1615. Portrait paintings which were well-framed from the beginning have generally retained their original frames. These were not usually official portraits, intended to be part of a scheme of decoration, but were more individual and relatively more conservative in style. When the Royal collections were redeployed at the beginning of the 19th century, many portraits, often with very beautiful frames, went not to the Royal Gallery of Paintings but to Rosenborg and Frederiksborg Castles, where they remain. This was far from advantageous for the Royal Gallery, which had a mixed collection including some poor quality work, but this was what was transferred to the Statens Museum for Kunst. The oldest frames in the Royal collections are found on two small and unpretentious portraits, painted by an unknown German artist in the 15th century. As well as being the oldest they are also the only extant examples of engaged frames: that is, the frame and painting constitute one single indivisible unit. These portraits, of a German couple, appear in the inventory of the Royal Kunstkammer as early as 1690. The frames of both are inscribed, and that of the man has the date they were painted – 1472. ‘The normal type of frame at the time of Christian IV, according to what is written in inventories and accounts, was either gilded or black; the black ones were either stained or painted with black oil colour. The frames were often described as smooth […] From the beginning of the 1640s, there are frequent references to ripple frames, often made of pearwood, first made by the cabinetmaker Jørgen Flauger in 1642 for the prince’s court. 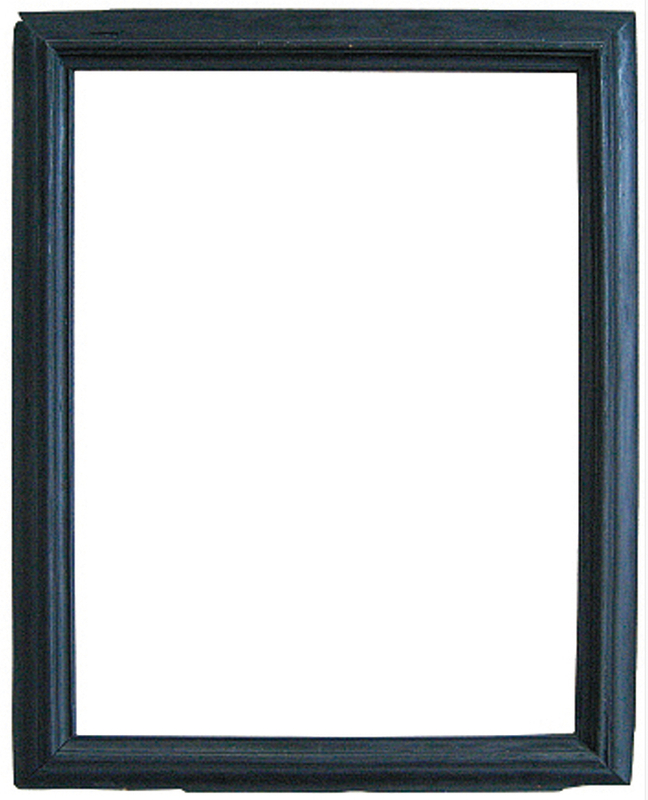 Besides pine and oak, walnut and lime are mentioned as wood for frames. After 1660, the occurrence of other types of frame is more frequent: octagonal, inner oval frames, white frames (mostly for engravings), frames with gilding or red and green colours; in some cases the frames were indubitably painted and shaped in interplay with the rest of the design of the room. This is especially true of the more numerous and more magnificent carved frames which are described now and then in the Sophie Amalienborg accounts. From the middle of the 1670s, it is not unusual to read of glass in the frames, and (in the 1680s) of embroidered frames, which were, however, presumably a short-lived fashion’ . There is a single survivor of these embroidered frames on a portrait of Frederik III at Rosenborg. Povl Eller also refers to the Sophie Amalienborg Palace and its disastrous destruction by fire in 1689. Amongst the paintings which were saved were ‘Kings with black frames, carved and gilded’ and ‘one depiction in a plain oval gilded frame, rather dilapidated’ . War and fires frequently triggered the inventory-taking which has been so useful for later historians: for instance, notes made by the palace steward at Frederiksborg in 1661 after the Swedish plundering of the castle, in which he mentions both black and gold frames . It has unfortunately not been possible yet to find out whether any of these are still in existence. It is probable that frames from the Royal collections were destroyed or left the country as early as 1600, through the wars with Sweden. A number of framed paintings and some empty frames were part of the enemy’s booty and are still kept at Skokloster Castle, north of Stockholm in Sweden. Their Danish provenance was painstakingly documented long ago on small labels on the backs of these frames. They tend to be rather primitively constructed but well-proportioned, with various different profiles; some of them are still empty after 350 years, unless they have survived the loss of other paintings. 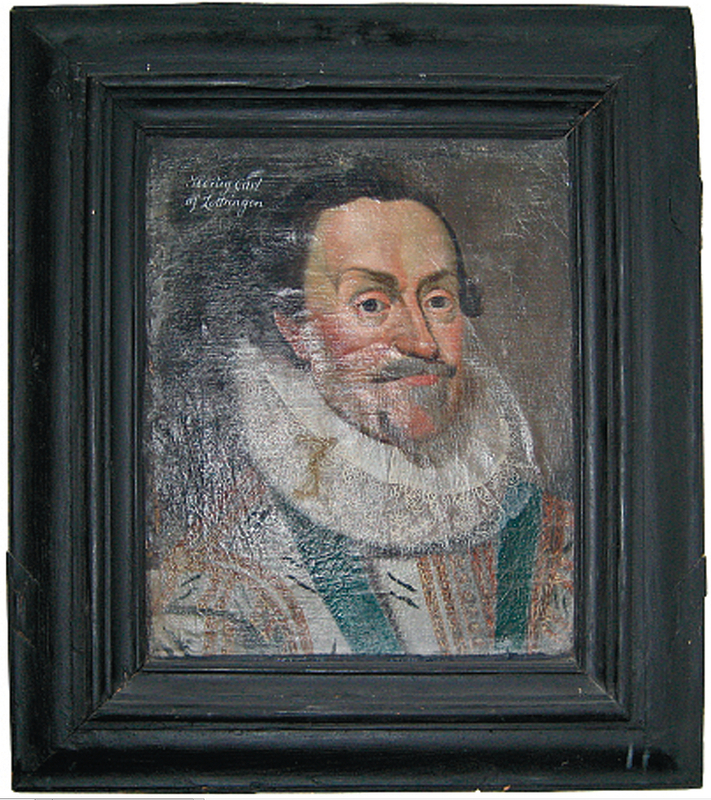 Unknown artist, Portrait of Karl von Lothringen, in black-painted Danish frame. Skokloster Castle, Sweden. The paintings in the Skokloster Castle frames are mostly portraits, and are – generally speaking – of inferior quality: they probably do not come from the Royal palaces but from somewhere in the provinces. Their origin is difficult to determine, but the continued existence of these frames far away in Sweden shines a light on conditions in Denmark in the 16th and 17th centuries. Both war and fire were constant threats to the contents of the Royal palaces, but there were other dangers lurking inside. H.C. Bering Liisberg, the first historian of the Royal Kunstkammer, relates how monkeys and parrots roamed the rooms in Christian V’s time. ‘From old accounts one can see that the monkeys notoriously picked apart the wall coverings of gilded leather, while the parrots destroyed the looking-glass frames, so they must have been able to fly about freely’ . Presumably it was not just looking-glass frames which were exposed to the depredations of these unruly pets, but also the picture frames. Careful notes were made in the Royal accounts when a couple of new acquisitions by the Royal Kunstkammer of Frederik III’s time were framed; Jacob Jordaens’s large painting, Achelous defeated by Hercules, dated 1649, received a black-painted frame on 6 March 1653, whilst in June 1655 Karel van Manders’ A Tartar legation visits Copenhagen in 1655 was also framed . Both pictures are still in the collection, but the frames described are long lost; perhaps in the palace fire of 1884. Old photographs in the Museum archives from about 1900 reveal that the Jordaens picture by then had a comparatively new, contemporary frame – also since replaced by a more neutral design: the present frame on The creation of the horn of plenty is number three, at least. Another painting by Jordaens, Susanna and the Elders, has a similar history; this painting, however, has now acquired a reasonably presentable carved and gilded Baroque moulding. An idiosyncratic detail of framing relates to the arrangement of the Perspective Chamber in the Royal Kunstkammer, Copenhagen Castle, also during Frederik III’s reign in the 1660s. This room contained 15 trompe l’oeil paintings by Cornelius Gijsbrechts. It has recently been suggested that these paintings, the majority of which have miraculously survived to this day, were not originally framed and were hung on boards to enhance their illusionistic effect, an important element of the programme of the Perspective Chamber . When the paintings were taken down from the Royal Kunstkammer at a later date, probably on the dispersal of the collection in 1824, or as part of a rebuilding scheme in 1764, most of them were framed with a simple black-painted moulding, which was hammered onto the sides with coarse hand-made nails. However, at some time in the 18th century a few from the group of 15 were given gilded hollow frames. The difference in framing suggests that the Gijsbrecht pictures were separated from each other, and it is reasonable to assume that the paintings with the black-painted mouldings were exiled to one of the royal storehouses, such as Fredensborg Palace, as early as the 18th century, thus happily surviving the two fires at the Palace of Christiansborg. The gilt moulding probably has a Copenhagen connection, such as the Royal Kunstkammmer or some other location at the Palace of Christiansborg. All the stored paintings at Christiansborg were burnt during the fire there in 1884, and the majority of the Gijsbrecht paintings would also have been consumed if they had not been hidden away at Fredensborg; their artistic merit was not recognized until the end of the 20th century. Today, according to accepted policy regarding these pictures (which are so important for us now), any reframings have employed an imitation of the simple black-painted frame and a rejection of the gold moulding, although the effect of this is to camouflage certain historical references in the collection. It is in any case quite likely that the black frames were not used for aesthetic reasons but simply to protect the paintings. The situation is still unclear, partly because of the frames; but now, so many years later, we can only be thankful that Gijsbrechts painted his illusions on canvas, and not directly on the boards which held them in the Royal Kunstkammer, which have long since been destroyed. 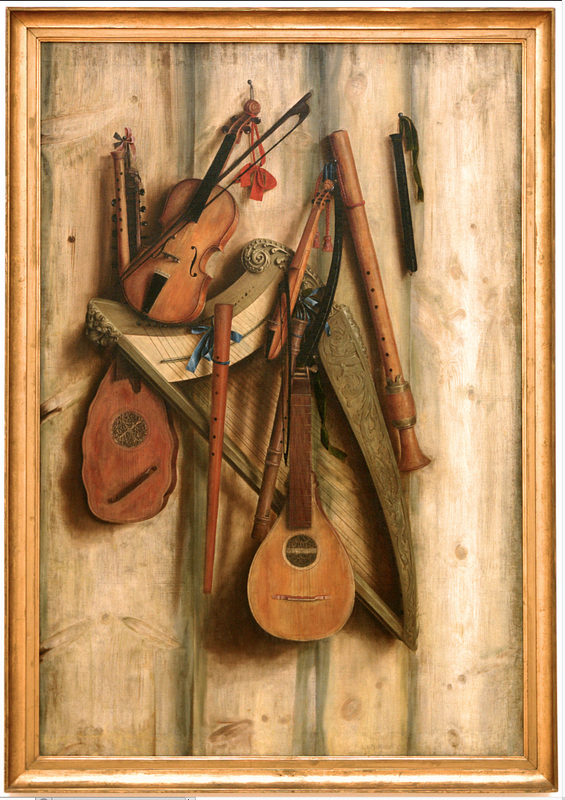 In connection with Gijsbrechts’s work, mention must be made of two more examples of the Museum’s unique collection of trompe l’oeil paintings. 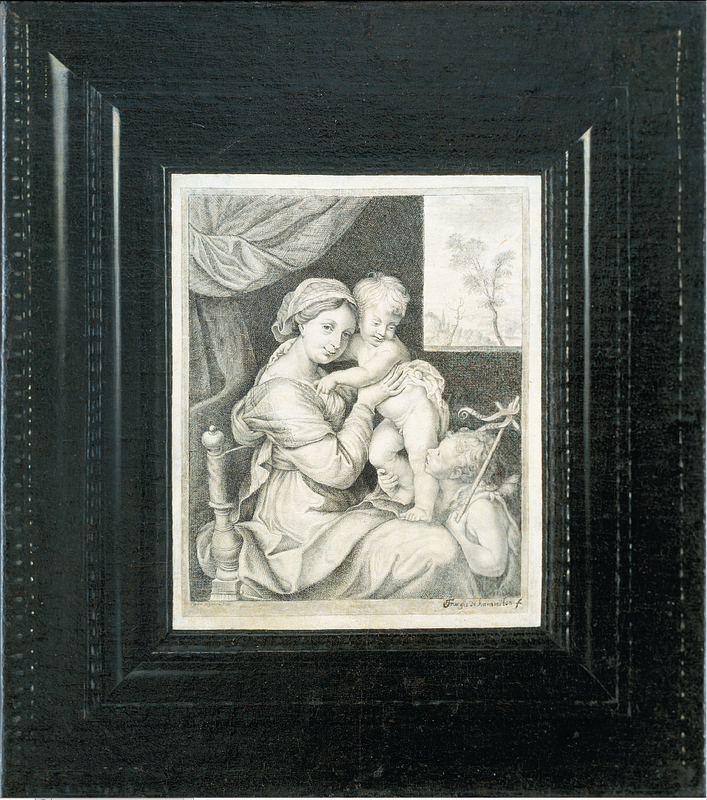 One by Franz de Hamilton is a realistic imitation – on canvas – of a typical 17th century ebony frame with ripple mouldings, surrounding an equally carefully imitation of an engraving of a Madonna and Child. 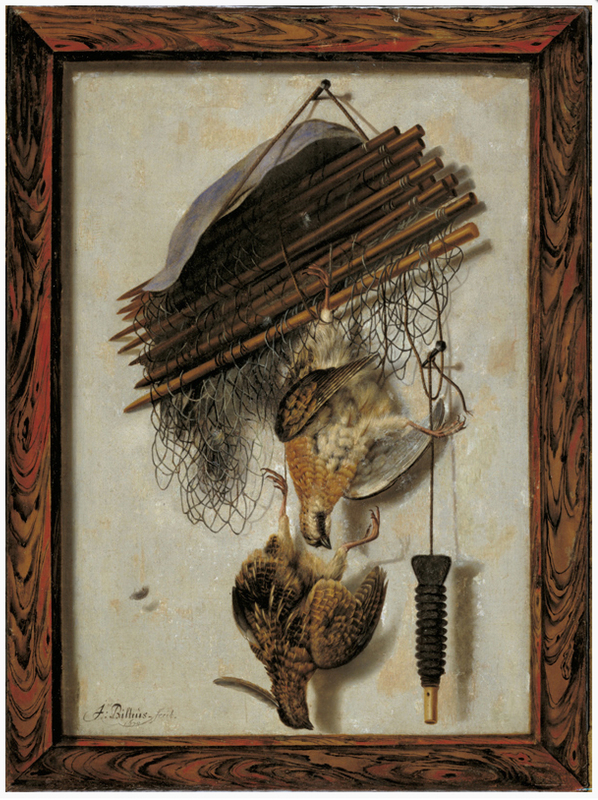 The other is a still life of dead game birds by the Dutchman Jacob Biltius, dated 1679, with its illusionistically painted, figured wooden ‘frame’, which is again part of the flat canvas. The effect of these trompe l’oeil frames is extraordinarily realistic. Both artists have executed the motif of picture plus frame as a whole and undivided object: their purpose was of course both to surprise the observer and at the same time to demonstrate their technical ability. Fortunately, amongst the real frames, a few real pearls have been preserved in the collection. A striking example is the French Louis XIII frame on Rubens’s portrait of Mattheus Yrsselius. This is distinguished by its elegant and plastic carvings of swags of alternating bay and oak leaves, each gathered by a small bow, with a fleur-de-lys held in a heart-shaped cartouche at each corner. It is a miracle that this frame has survived through all the years in such a good state of preservation; but the work was not acquired until 1809 with Consul Hans West’s collection – that is, after the first fire at Christiansborg in 1794. 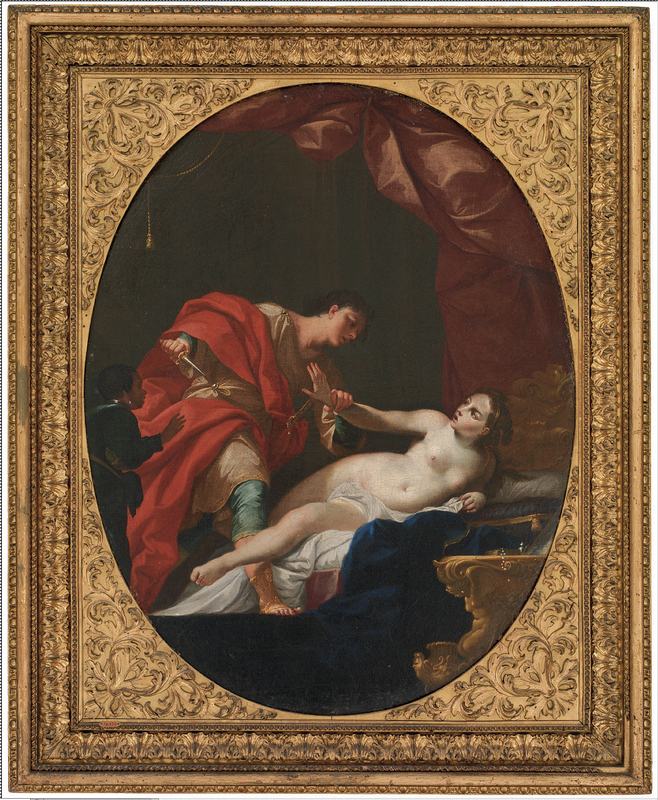 The Museum also owns some first-class 18th century Italian frames, both in style and execution, one of which is the Roman ‘Salvator Rosa’ frame on Tarquin threatening Lucretia. This is ornamented with egg-&-dart on the back edge, and finely-carved acanthus-&-shell moulding on the applied ogee; the spandrels are enriched with scrolling acanthus leaves. 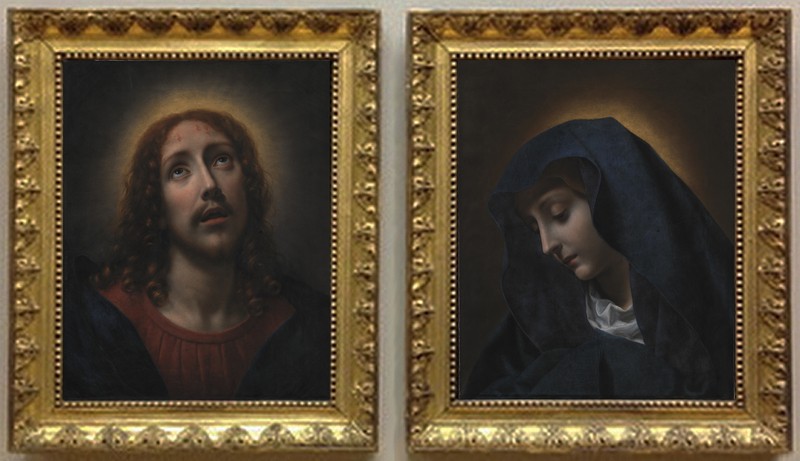 Two others are the original frames on a pair of paintings of Christ and the Virgin Mary by Carlo Dolci; these are also 18th century, and are decorated with finely-carved acanthus leaf ornament. 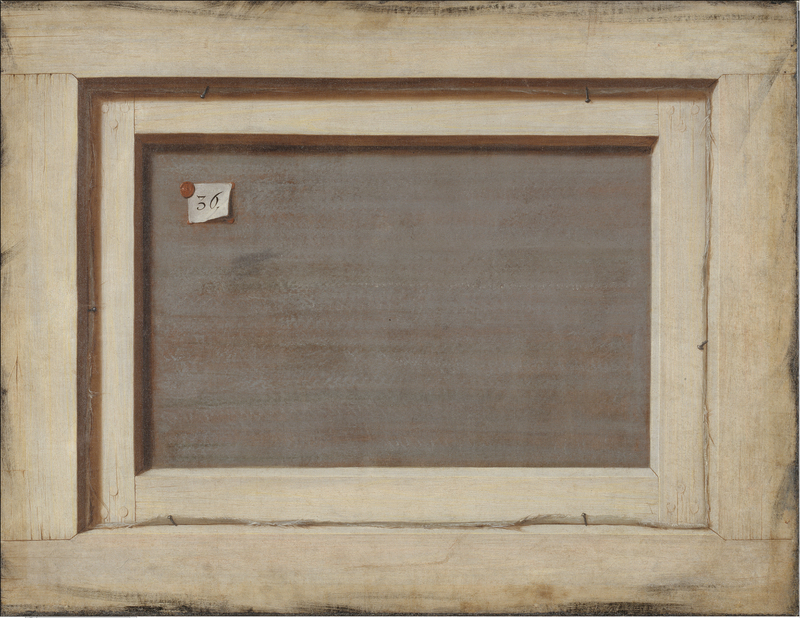 Unfortunately, organized documentation of the frames is very rare, so there is an added historical interest in the small group of Italian paintings which the art dealer Gerhard Morell acquired for the Danish king in 1763. 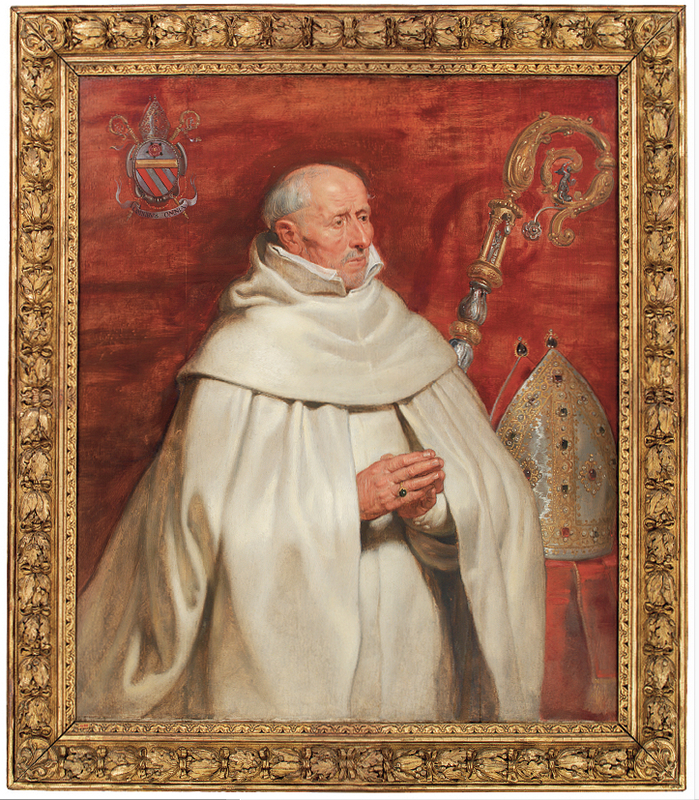 They were bought at the auction in Amsterdam of the collection belonging to a Roman cardinal, Silvio Valenti Gonzaga. A large painting by Giovanni Paolo Pannini (1749, Wadsworth Atheneum) gives an impression of the cardinal’s magnificent gallery in his country house at Porta Pia, Rome, with sumptuous stucco decoration, and paintings hung edge to edge from floor to ceiling. We know that Pannini’s depiction of the room does not completely correspond to reality, either in its dimensions or decoration. However – and this is most important in our connection – all the paintings, of which many are identifiable, can be seen to be framed in fairly uniform contemporary ‘Salvator Rosa’ frames, including those which later ended up in Copenhagen. In the foreground of Pannini’s picture, St Margaret by Ortolano and the Portrait of Lorenzo Cybo by Parmigianino can be seen hanging on the extreme right-hand side, one above the other, with Federico Barocci’s Annunciation on the centre left. The paintings by Ortolano and Barocci have both retained their frames from Valenti Gonzaga’s time (1740s); when the Ortolano hung in its original setting – probably in a church in Ferrara – it may have been set into a stucco niche. The Parmigianino is now displayed in an almost identical ‘Salvator Rosa’ frame – not the lost original but another, taken from a less important painting from the same Gonzaga collection, which was in store in the Museum. It was reframed before being sent for exhibition in Italy. The craftsmanship of these ‘Salvator Rosa’ frames in the cardinal’s collection is particularly finely-executed; there must have been many master carvers employed by the Roman workshops when the framing of his great collection was in hand, since it ran to several hundred works. 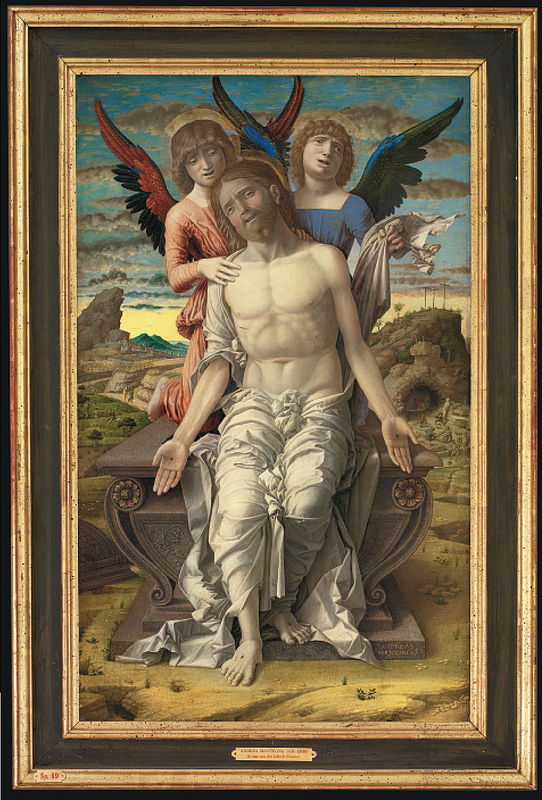 Mantegna’s painting of Christ, now in the Statens Museum for Kunst and also formerly in the cardinal’s collection, is not shown in Pannini’s painting: Mantegna’s art may not have been so highly valued in Valenti Gonzaga’s time. A 19th century photograph reveals that it had previously been framed in a ‘Salvator Rosa’, like the rest of Gerhard Morell’s purchases, with a profile practically identical to the frame on Barocci’s Annunciation. The latter, with its characteristic stylized acanthus moulding on the sight edge, can hardly have suited the Christ especially well (above), and a reproduction tabernacle frame was made for it – possibly for the opening of the Museum in 1896. However, this was also rather a heavy design (below), and, after criticism by the Museum director of the 1950s, it was reframed in a more sober and unadorned cassetta frame (above), painted black and parcel-gilt in contemporary modernist taste. The tabernacle frame has now been restored to it, primarily out of historical regard for the collection, following the recently completed conservation of the painting. 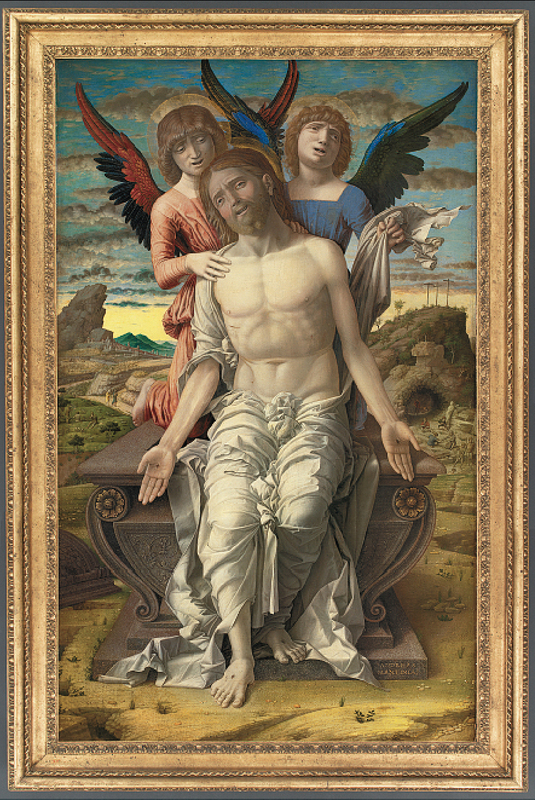 We do not know what the original frame of the Mantegna looked like, but recent investigations have revealed that it has left a ghost of its presence – round the edge of the painting is a swelling in the ground (known as a ‘beard’) which marks the junction between the wooden panel and an applied frame. Mantegna’s painting was produced at a time when the creation of the frame might precede the execution of the painting for which it was designed. It is uncertain whether this original frame would have been a carved aedicule, or a narrow moulding with which it could have been fitted into an integrated architectural frame inside a church. Today we can only fantasize as to the original context of the picture, and also hope that one day it may be reframed in a more authentic manner, in keeping with the style of Mantegna’s painting. 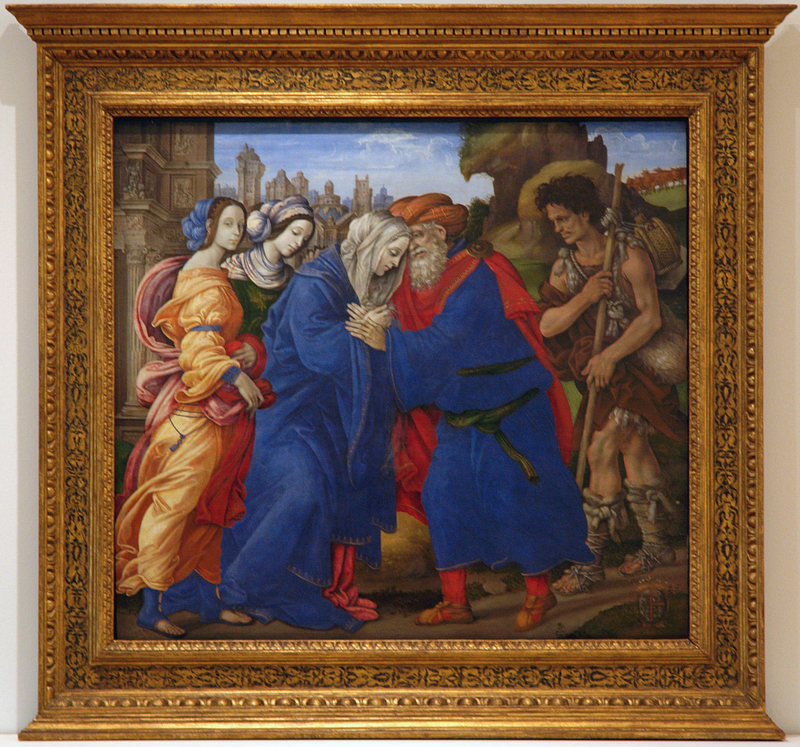 It was probably around the time of the Museum’s removal to Sølvgade in the 1890s that another masterpiece from the collection of early Italian works, Filippino Lippi’s Meeting of Joachim and Anna at the Golden Gate (1497), was similarly reframed in a reproduction aedicular frame – large, bombastic, painted and gilded, with pilasters and complex mouldings. Later on this setting, more like a piece of furniture than a frame, was taken off the painting and put into store, and the picture was exhibited without any frame. 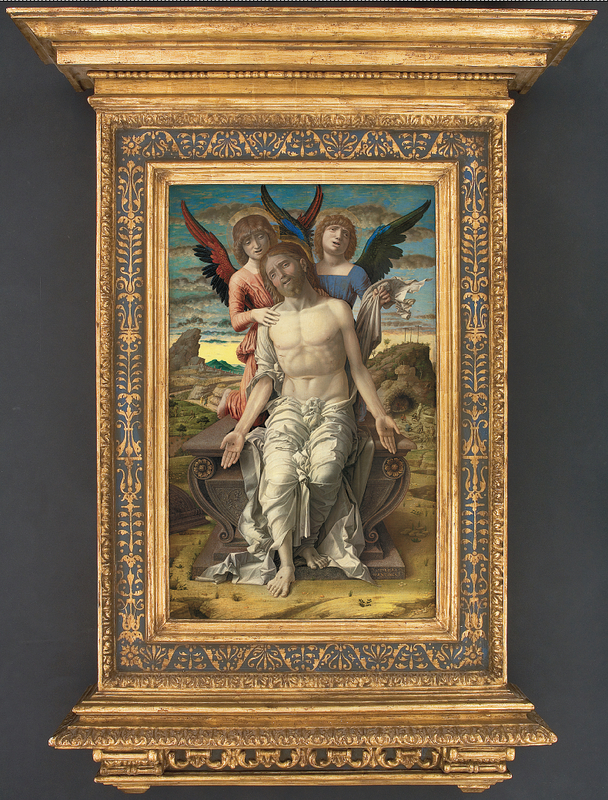 When the painting was restored in 1997-98, a new and more subtle frame was produced for it in London (above), using sketches after the Renaissance altarpieces in Santo Spirito, Florence – a church which is particularly rich in original frames. It may well be, however, that this design will come to appear equally dated and of its time to future generations. It is clear that hardly any of those who have researched the decoration of the royal palaces in the 18th century have dealt specifically with the picture frames (unlike the looking-glass frames). The single exception is a reference in a description of the Guard Room at the new Christiansborg Palace, dating from 1838, to two picture frames made by the sculptor Le Clerc, who produced countless frames for the palaces. In a drawing by Wilhelm von Haffner of Christiansborg in 1781, His Royal Majesty’s apartment, all the paintings (including a large equestrian portrait of Christian IV, now at Frederiksborg) seem to be mounted directly onto the wall in fixed frames, presumably of stucco. These were designed by the architect Niels Eigtved, but it’s probable that many other fashionable architects – such as Caspar Frederik Harsdorff, Nicolas-Henri Jardin and Joseph Christian Lillie – would also have designed picture frames for the king’s collections, besides looking-glasses and other furniture. Further research into these architects will, it is to be hoped, reveal more surviving frames to their designs in the royal collections. It can also be assumed that fixed frames dominated in the State Rooms as part of the overall architectural design, as can be seen in a rare sketch by Eigtved, whilst moveable frames were used in picture galleries and in the royal family’s private rooms. The 1794 fire at Christiansborg led to a tragic loss of works of art and their frames, including at least twenty belonging to paintings by François Boucher. There are several extant accounts from the night of panic, 26th February, when the burning palace was evacuated by the acting palace steward of the Royal Kunstkammer, Johan Conrad Spengler, and through a brave if somewhat brutal operation by the Navy. Most of the paintings were saved, but for the sake of speed the canvases were simply cut out of their frames before they were taken to safety in Holmens Kirke and the Admiralty building on Slotsholmen; the frames were left to go up in smoke . Quite a few of the rescued paintings are in landscape format, indicating that they were originally overdoors; they have never been suitably reframed in the correct style, appearing even today in very simple narrow, rather mean gold mouldings. Examples of this include Girolamo Troppa’s two lively mythological subjects from the end of the 17th century, Mercury killing Argus and Apollo flaying Marsyas, for which ‘Salvator Rosa’ frames – or, even better, Baroque leaf frames – would have been ideal. Lucas Cranach the Elder (c.1472-1553), Melancholy, c.1532. Statens Museum for Kunst. Because of the 1794 palace fire Rococo and NeoClassical frames are poorly represented today, as far as Old Masters now in the Picture Gallery at Christiansborg are concerned. In order to fill this gap, a gallery or livery frame was created – possibly designed for a rearrangement of the Royal Kunstkammer at the end of the 18th century, or for a rehanging of the Picture Gallery at Christiansborg in the 1820s. This frame is a rather heavy cassetta with a black-painted frieze between two bands of gilded ripple moulding; the outer edge, where it faces the wall, is usually painted vermilion. The black frieze must have been chosen for economic reasons, since the few examples of the style which are completely gilded appear lighter and more elegant. This ‘ripple’ frame has left its pervasive mark on the Dutch and German part of the Royal collection, overwhelming other designs. It is probably here to stay; although it should be excised for historical and aesthetic reasons, it would not be economically viable to replace it with more stylistically accurate patterns. 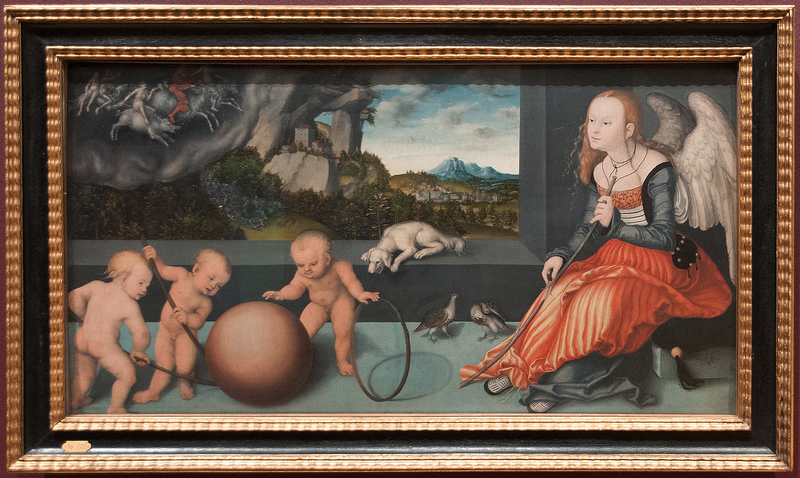 A good example of the effect of this gallery frame is in its use for small, delicate works by Lucas Cranach the Elder; these would probably have been framed originally in simple ebony, ebonized or black-stained settings with subtle ripple mouldings, according to the fashion when they were originally hung in the Kunstkammer at Gottorp Castle. As this gallery design reveals, changes in the framing of the paintings collection have been made over time. However, no consistent or militant policy of reframing has been pursued, fortunately – in contrast to several other royal collections in Europe. A demonstration of the aesthetic problems caused by the standardization of frames throughout a collection can be seen, for example, in the Rococo frames of the Gemäldegalerie, Dresden, and also to some extent in the Louvre: Napoleon’s hand can be discerned in the number of Empire frames. A couple of examples of an elegant Louis XVI model are preserved in Copenhagen; their parcel-gilt and silvered, laquered and fluted outer mouldings are adorned with interwoven garlands of flowers. This model was possibly designed as a livery frame for the gallery in the first Christiansborg palace at the time of the architect, Jardin . A similar principle of standardization can be seen at work in a modest way in the small collection of paintings which the king’s personal surgeon, Johan Christian Bodendick, sold to his employer, Frederik VI, in 1810. Bodendick, who was apparently an obsessive collector of art, had all his pictures put into contemporary settings – not an unusual fate for a collection. They were set in uniform gilt frames dating from about 1790, with an architrave profile decorated with classicizing bead-&-reel ornament. These are stylistically unsuitable both for dark Dutch landscapes and genre paintings, and curators have since replaced them with more appropriate patterns. 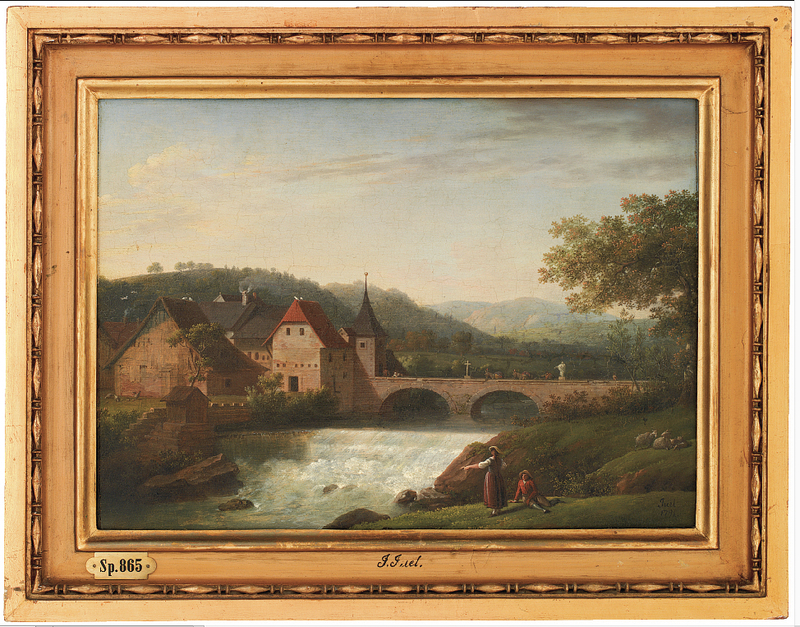 They have been retained in the collection on several contemporary landscapes and portraits by Jens Juel, some of the portraits in an oval version. The NeoClassical design created for many paintings by Nicolai Abraham Abildgaard is a special case. It is another architrave frame with a top moulding of oak or bay leaves, a plain frieze, and beading at the sight edge. 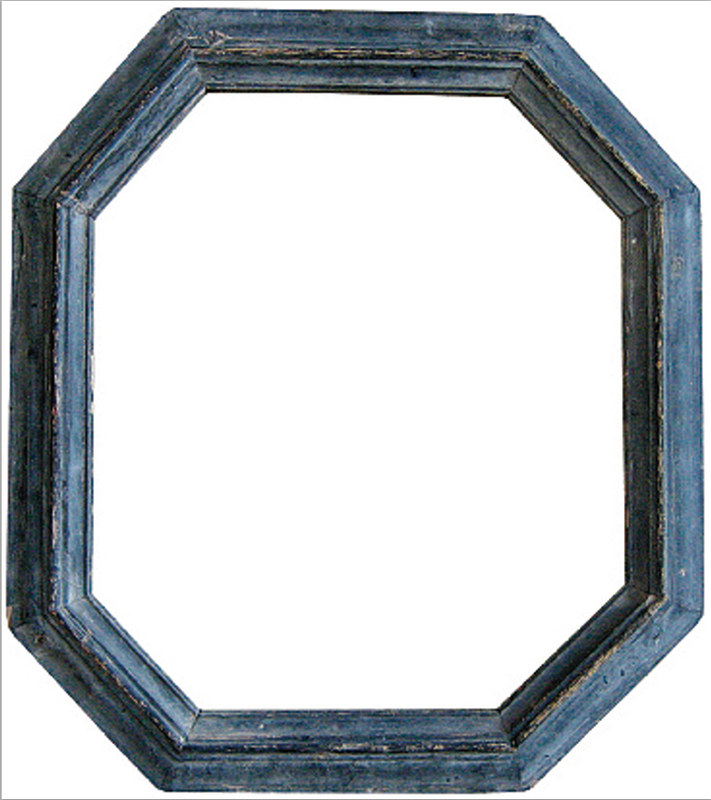 It’s tempting to believe that Abildgaard himself chose or designed this type of frame, which was probably produced around 1800. 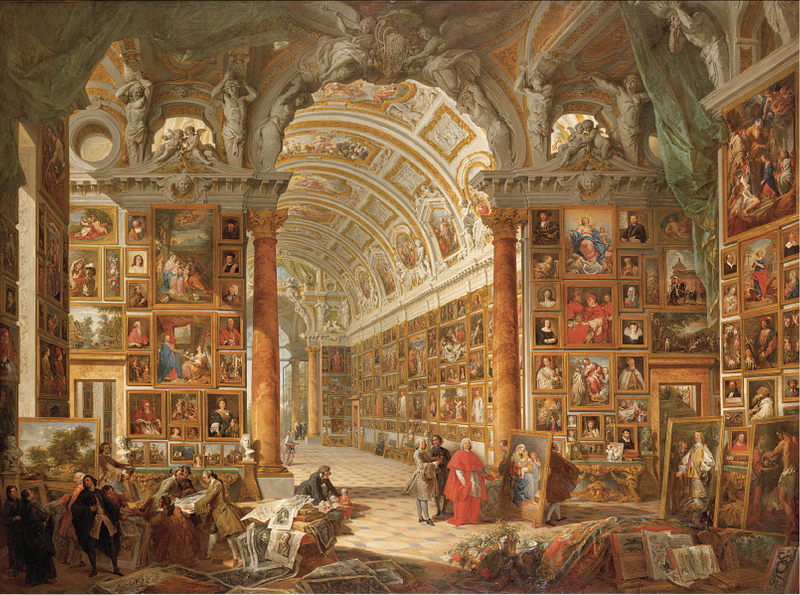 After the Royal Collection of Paintings opened to the public at Christiansborg in 1828, there was a lean period for the acquisition of foreign works and their frames. J.L. 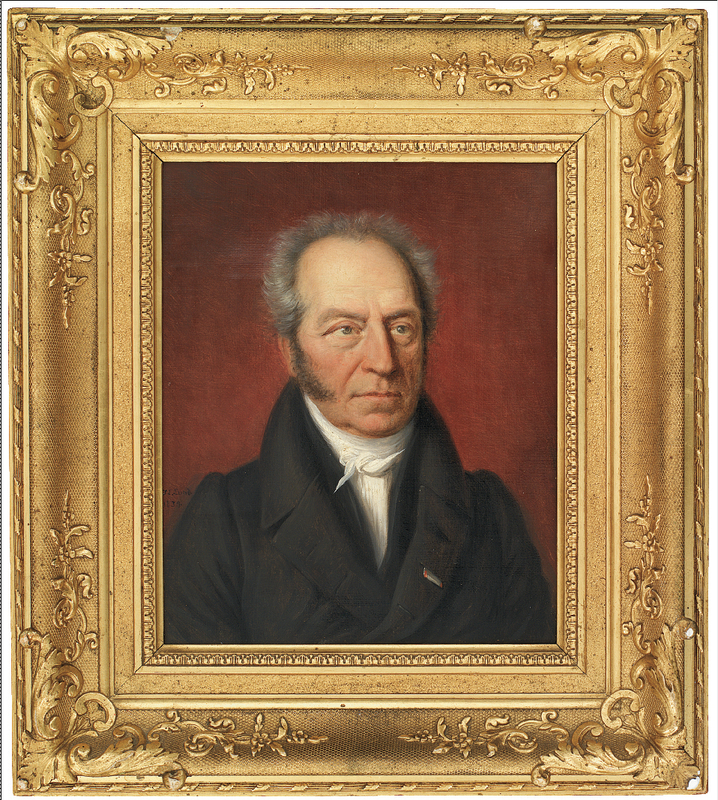 Lund, J.C. Spengler, Curator of the Royal Danish Kunstkammer, 1834, o/c, 23 x 18.8 cm. Statens Museum for Kunst. However, a great many contemporary Danish works of art were purchased, some of which had fine Empire frames by the court gilder Peder Christian Damborg and his peers. Unfortunately the use of workshop labels was not yet widespread, so that it can be difficult to distinguish the work of different masters. Damborg, however, made a conscious decision to use labels, and his frames are identifiable as amongst the best of his generation. 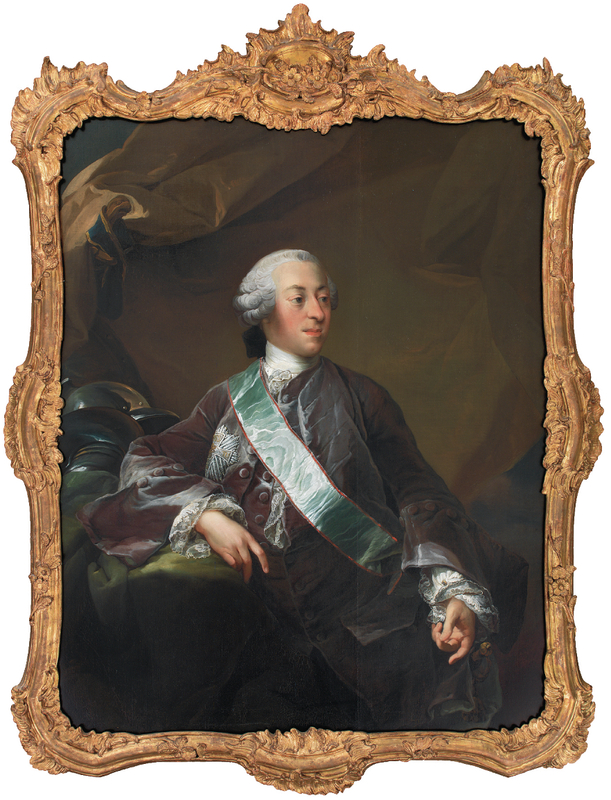 J.C. Lund’s portrait of Spengler (who is remembered for having been forced to abandon so many frames when Christiansborg burned in 1794) is set in a contemporary frame by Damborg, and together they form an effective and striking whole. Sadly many 19th century frames are hidden from the public gaze in store at various royal palaces; this does mean, however, that they have been protected from culling by curators and museum directors with an overly critical eye. Laessøe’s Terme di Caracalla…, for instance, in its frame by Damborg, has either been hidden in a storeroom, or has been out on loan, and the revival Rococo frame has thus escaped being purged by purist museum staff. 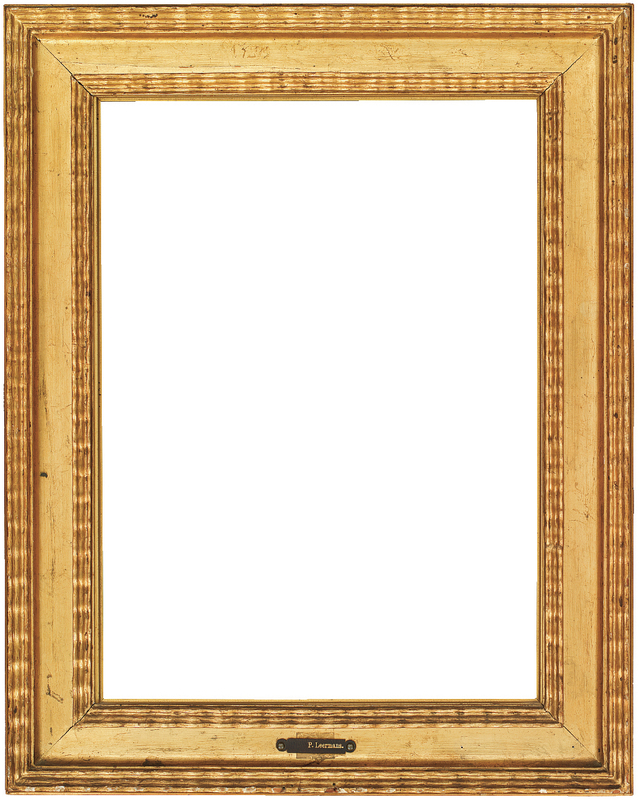 Gilded finishes predominate in this period, from which two exceptional painted frames stand out. They were executed by the landscape artist, Georg Hilker, for his friend Christen Købke. 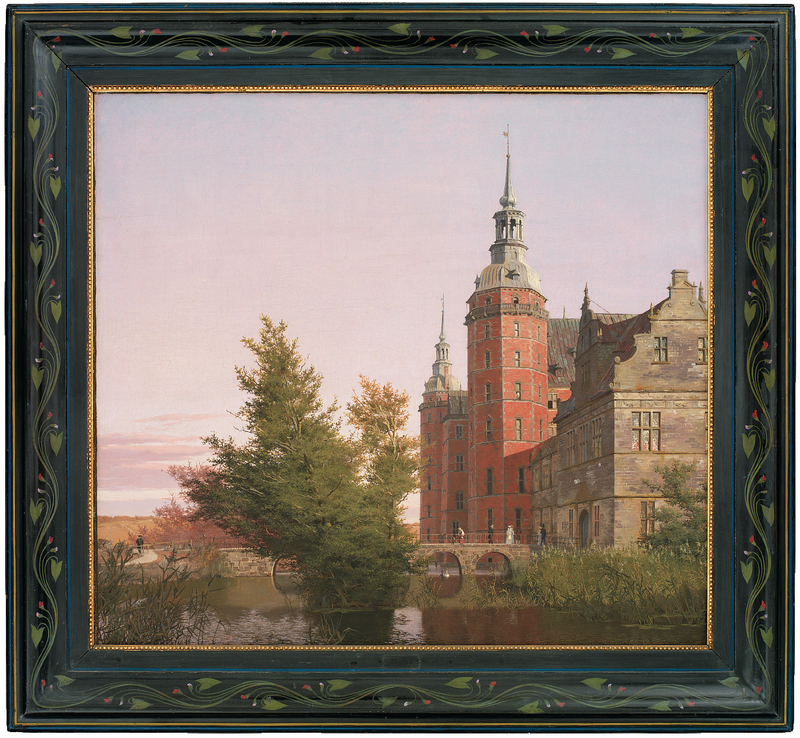 One was for Købke’s Morning view of Østerbro; the other, a particularly fine frame decorated with stylized bindweed, was for his painting, Frederiksborg Castle: view near the Møntbro Bridge. Hilker also decorated the frame of his own portrait by Købke. 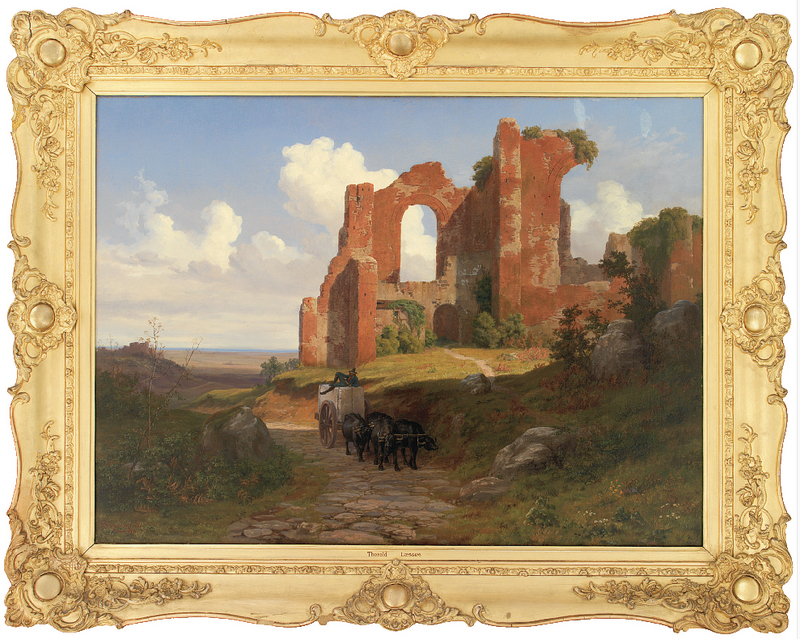 The few exceptions to Danish art and frames which dominate the collection in the 19th century, include – for example – the small collection of mainly Italian works which the archaeologist Peter Oluf Brøndsted bequeathed to the king. The recipient obviously didn’t value them very highly, as almost all of them ended up in exile at Fredensborg; thus at least escaping the flames when Christiansborg Palace burned down. 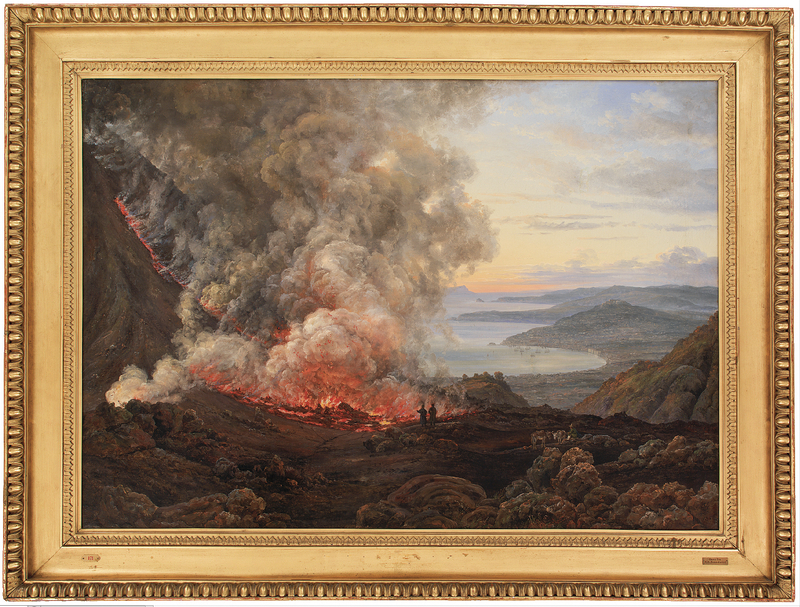 Their frames are mainly in a simple although rather heavy Empire style; a notable exception is the elegant contemporary frame of J.C. Dahl’s Eruption of the volcano Vesuvius, with its finely-carved egg-&-dart moulding, possibly from a Roman framemaker. Given the fact that the collection boasts so many works from Italy by Danish artists, it is surprising that there are few frames originating from Italy. The explanation is that C.W. Eckersberg and his pupils used paper or board to paint on – for both practical and economic reasons – and waited to mount their pictures on stretchers until they had returned home. They also waited to buy ornamental frames until a purchaser turned up. On one or two of Christen Købke’s and J. T. Lundbye’s small pictures an interesting detail can be seen: the artist gave them a painted margin a few centimetres wide (Lundbye’s were black and Købke’s usually dark green). These painted borders may indicate that they were originally hung unframed in the artists’ rooms. Where the original stretcher is preserved, the hanging ring may sometimes remain as well. Not long ago a slim folder was discovered in the archives of the paintings collection; it contained tracings on paper of picture frames in the Dutch masters collection, made by Gottlieb Bindesbøll, the architect of Thorvaldsen’s Museum. Their provenance is rather mysterious, since a letter of 1908 in the folder indicates they were sent by one architect to another to be sold . 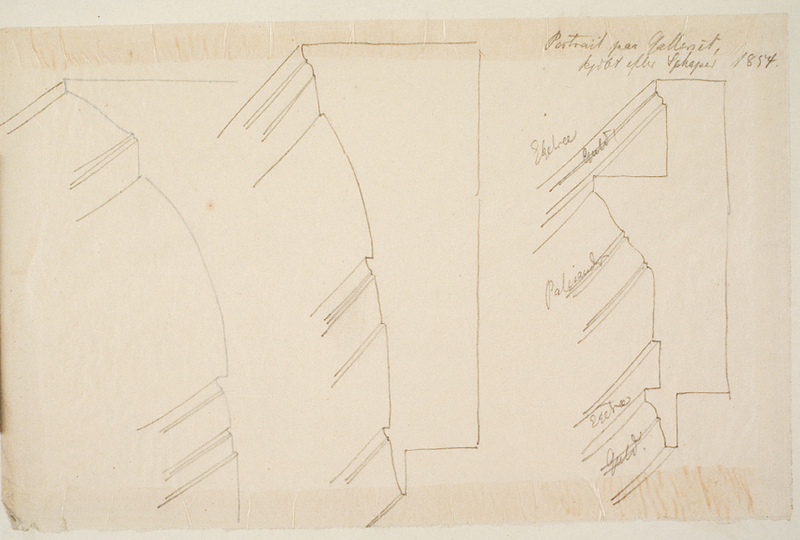 They comprise ten sketches of mouldings and profiles of some common frame patterns in the collection, giving these a definite attribution and dating them to 1858. They also reveal that the question of reframing was taken seriously during the directorship of the painting collection by N.L. Høyen. The tracings relate to frames for two large 17th century canvases by Herman van Swanevelt and Hendrick Jacobsz Dubbels, respectively a landscape and seascape , and also to two works acquired in 1858 – a small David Teniers genre painting, and a large contemporary forest scene by Godtfred Rump. The frames were apparently designed individually for each painting, and were inspired by Dutch Baroque patterns: the general section consists of a concave between stepped ogee mouldings, sometimes with a small astragal on the back edge, and an applied leaf or floral motif at the sight. They are oiled or stained and varnished, and some are parcel-gilt. Bindesbøll himself noted on his drawings that the finish might be ‘ebony without gold’, ‘black veneered maple’, ‘red, oak, gold’, ‘rosewood’ and ‘walnut’. These designs, rather monotonous in quantity, have left their mark not only on the Dutch collection, but on some of the larger 19th century Danish paintings; for instance those by Lundbye and Købke. Some frames by Bindesbøll snr were lost, although there are many after his design still preserved in store. Much work by the court gilder, Damborg, was also lost, including not only frames but furniture. After the fire in the palace, when the art museum (now owned by the state) was moved into the building designed for it by Dahlerup in the 1890s, there must have been a large reframing programme. Photographic evidence reveals that Italian works – by Filippino Lippi and Parmigianino, for example – were also reframed, although these have dated badly and have since been removed. And sadly few works by late 19th century artists who designed their own frames were acquired at the time, save for a couple by J.F. Willumsen and Harald Slott-Møller. There are none by Bindersbøll’s son, Thorvald; and the hand-carved frame for Joakim Skovgaard’s Christ in the realm of the dead, 1890, by Niels Larsen Stevns, has also been lost. 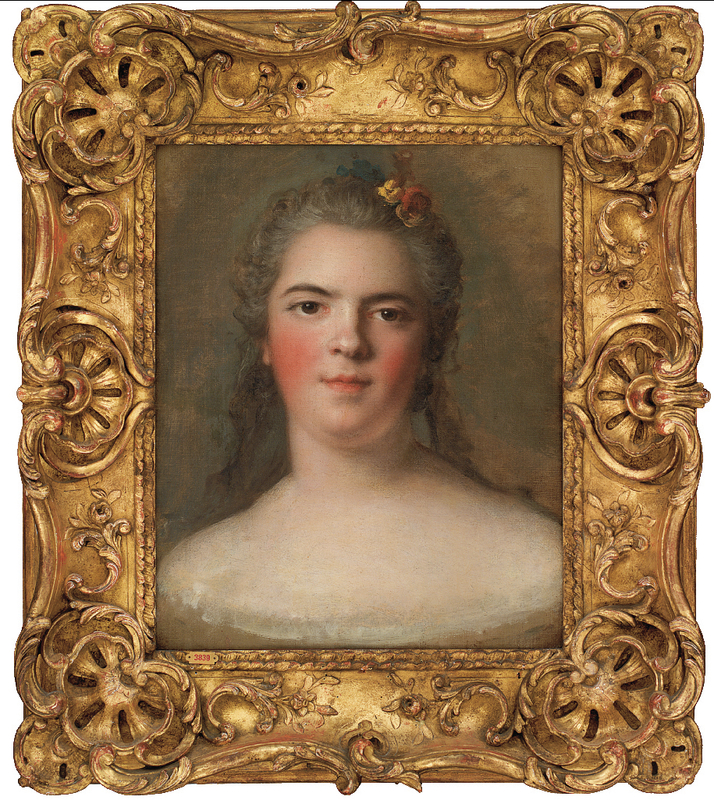 The frame collection at the Statens Museum for Kunst has been expanded in the 20th century by acquisitions of some paintings in handsome settings, such as the elegantly swept Danish Rococo frame on C.G. Pilo’s portrait of Mogens Scheel. This is typical of Scandinavian Rococo, with its shaped format, broken arcs, exuberant crest, and rocailles which stray onto the surface of the canvas, and is a considerable addition ot the collection. 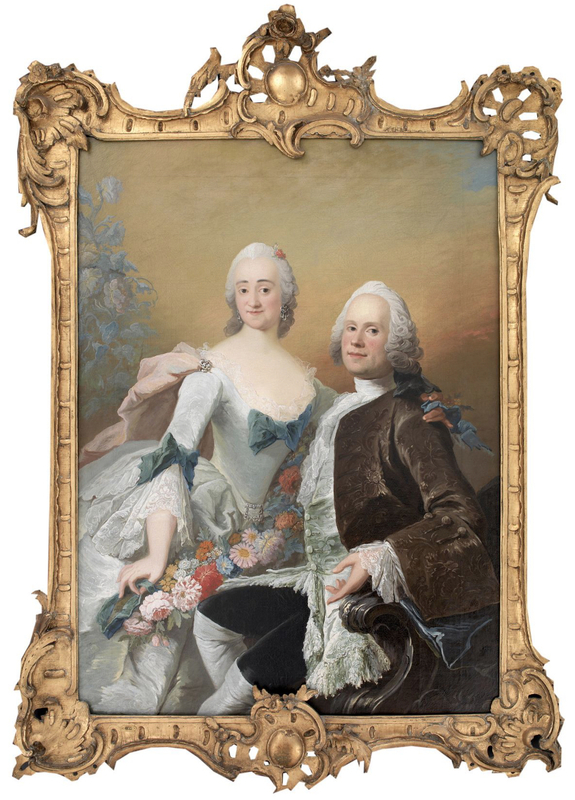 Another example from a still rather small collection of Danish Rococo is the frame on the double portrait of the court jeweller, Christopher Fabritius and his wife, with its slender rails and boldly-modelled asymmetrical centres and corners; a larger collection of excellent Danish Rococo frames can be seen at Frederiksborg. In contrast to these, paintings by artists of the Golden Age (in 19th century Denmark) have brought into the Museum a considerable number of NeoClassical and Empire frames of various types: in fact, these constitute the largest group of frames from any one period. 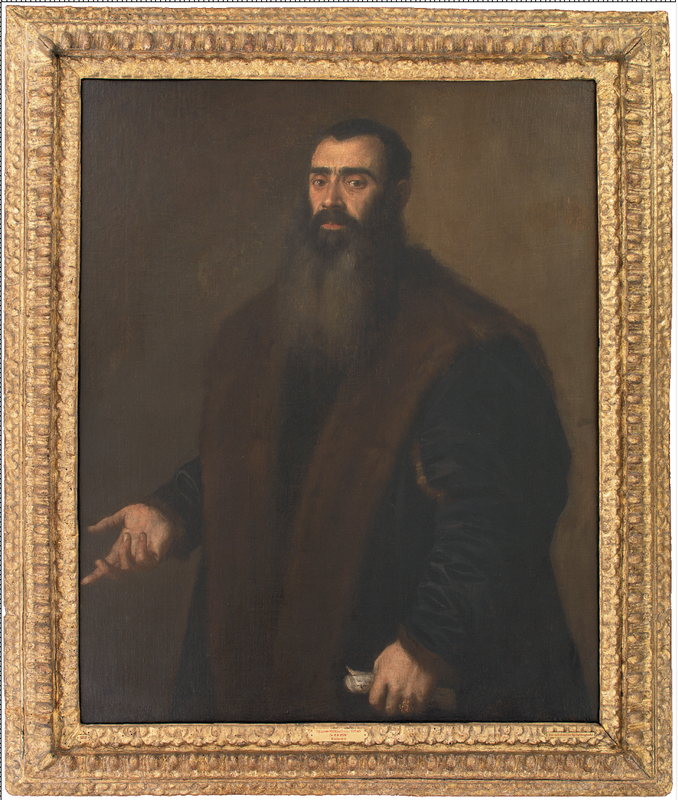 Amongst older examples from other countries, several new acquisitions have arrived in really fine Italian frames; for example, designs with fluting, knulled mouldings and pastiglia decoration on portraits by Titian and Tintoretto. 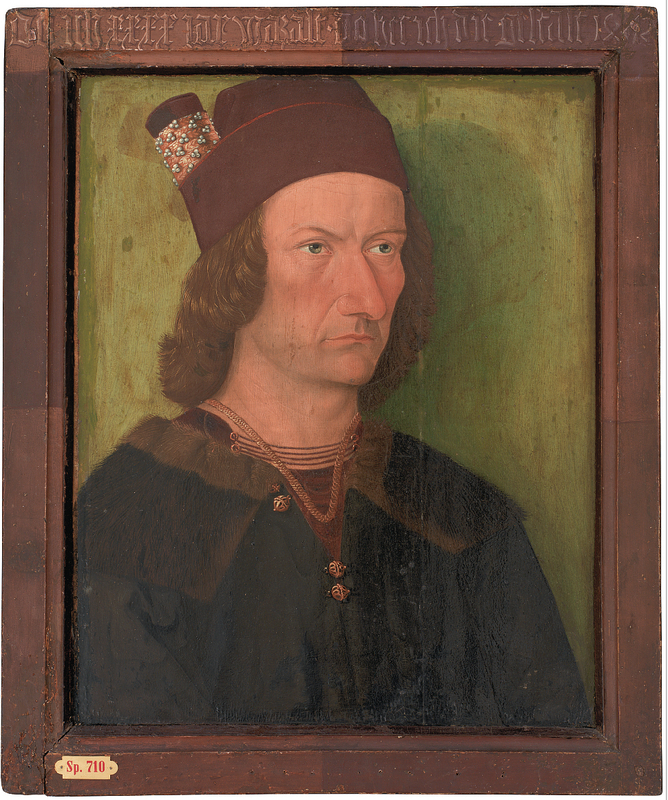 A case in point is the portrait of the Nuremberg merchant and art dealer, Willibald Imhoff the Elder, which has found the perfect partner in its frame. Sadly the Museum only possesses one female portrait (although a very fine one) from this period: a painting by Federico Barocci, the dating of the frame of which is still problematic. 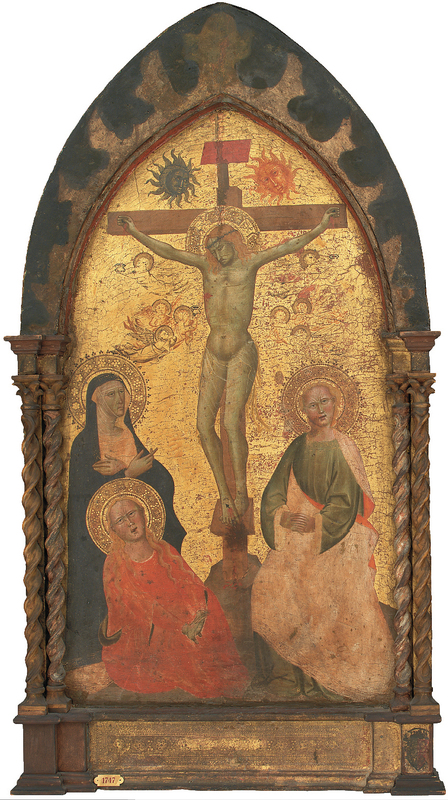 However, a small Crucifixion by the 14th century Maestro Francesco of Bologna, the Museum’s solitary example of an engaged frame, was acquired over a century ago. 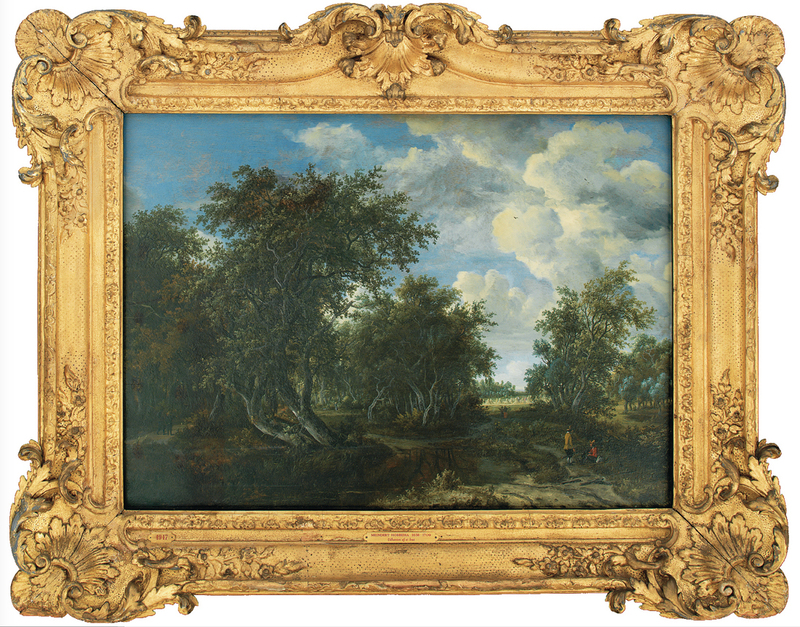 Some good Baroque frames have joined the collection in the 20th century, in some cases with the acquisition of Dutch works of art – for example, on landscapes by Ruisdael and Hobbema. It has also been possible to compensate for the loss of French art in the 1794 castle fire by acquiring small genre paintings by Nicolas Lancret, and others, in contemporary Régence frames. One fine example of 18th century French framemaking is the Rococo setting of the portrait by Nattier of Louis XV’s daughter, Louise-Elisabeth, with its asymmetric composition, sculptural rocailles, and delicately-carved violets and roses; this was acquired by the Museum in 1928. 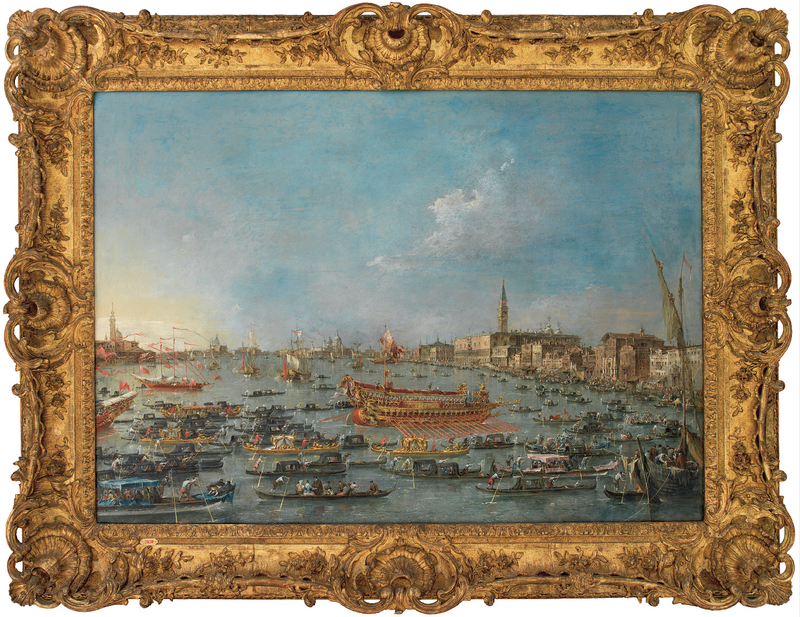 Another is the mid-18th century Rococo frame on Guardi’s The Bucintoro Festival, Venice. The problem with displaying works of art in a museum will always be a cause for debate. There is usually a continual process of small alterations and changes, unfortunately often undocumented, and this includes framing. An old photograph in the archives reveals that a Supper at Emmaus from the workshop of Rembrandt was displayed in a Louis XIV gilded frame (possibly Dutch? ), as late as the mid-1940s. The fate of this frame is unknown, but the painting has been reframed twice since then. A considerable amount of reframing has taken place in the Danish collections, and every 20th century director of the Museum has had a particular approach to the matter. Some photography survives from the reigns of several of them, but the one whose opinions we know most about is Jørn Rubow. He was a discerning connoisseur, consistent in excising frames which did not match his ideals. During the period when he was director, the Museum possessed a sophisticated cabintemaker’s workshop, and new acquisitions where the frames fell short were dispatched there to have them replaced or modified. The collection of art from the Golden Age in particular acquired an elegant uniformity, but this approach is open to question – especially where artists’ frames are involved. 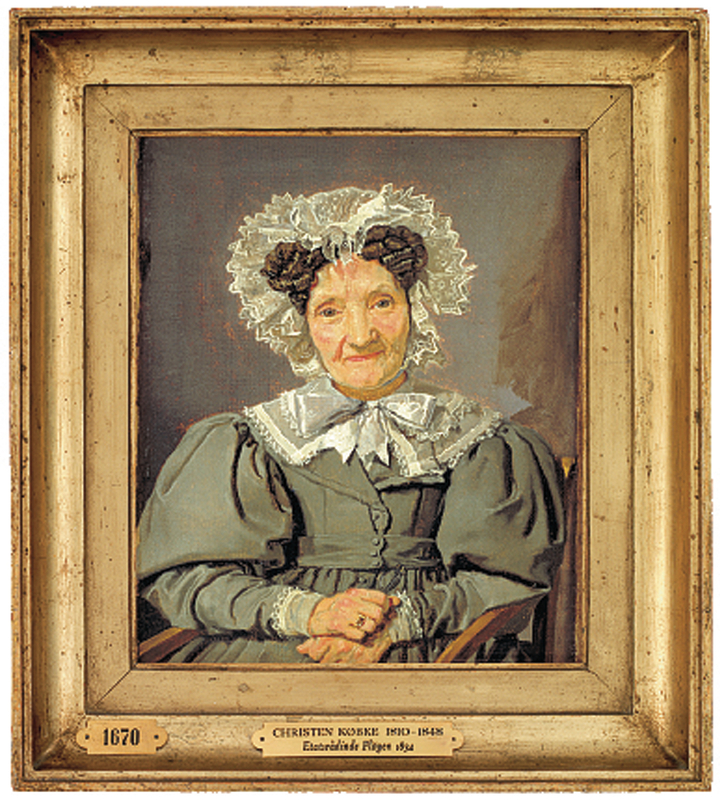 An instance of this is Christian Købke’s little portrait of Joanne Pløyen, where the original 1840s frame by the court gilder, Peder Damborg, with its textured ogee (created by adhering pieces of lace to the frame before gilding) has been replaced by a frame in an earlier NeoClassical style, characteristic of Copenhagen. Dambourg frames from this period and later, with their curving sections and embellished surfaces, were clearly too ornamental for Rubow, whose modern and rather Puritan taste was to have drastic consequences for the French paintings in the Rump collection. Many of the gilded frames on works by Dufy, Marcel Gromaire, Picasso and Derain were unfortunately removed, and the paintings mounted in plain, narrow oak frames where the top edge was level with the picture surface. Such a design has no moderating or transitional effect on the painting, no educative effect, and not even the protective qualities of a raised profile. 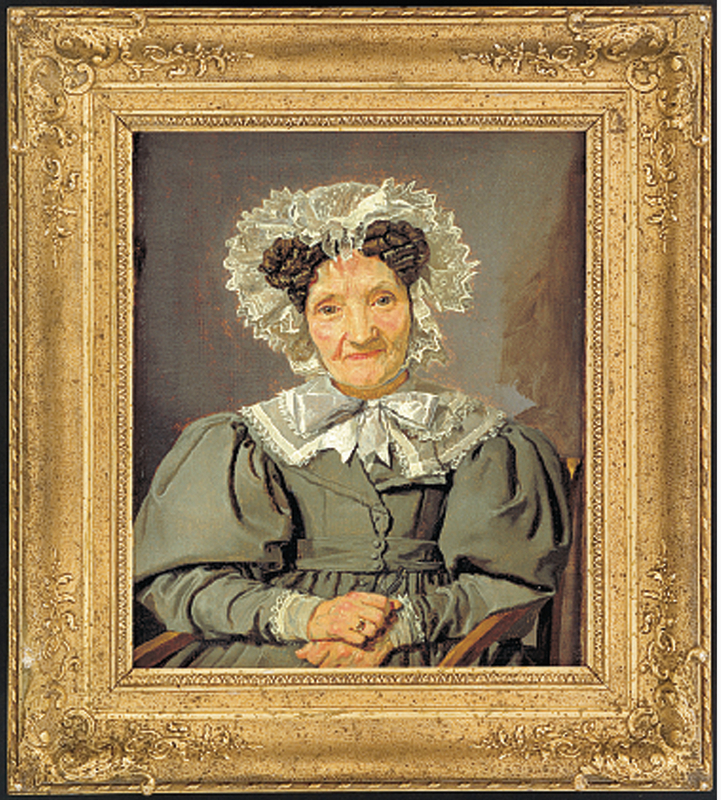 Despite the fact that some of the earlier frames could have been regarded as rather over-iced, Rubow’s measures were later regarded as too radical, and it was seen as important to track down the former frames in store in order to restore them to the paintings, or, if necessary, to obtain replacements. Fortunately – possibly because of his regard for the artist – Rubow (who was admired by his contemporaries for his presentation of the collection) spared Matisse’s paintings, several of which have fine antique frames. 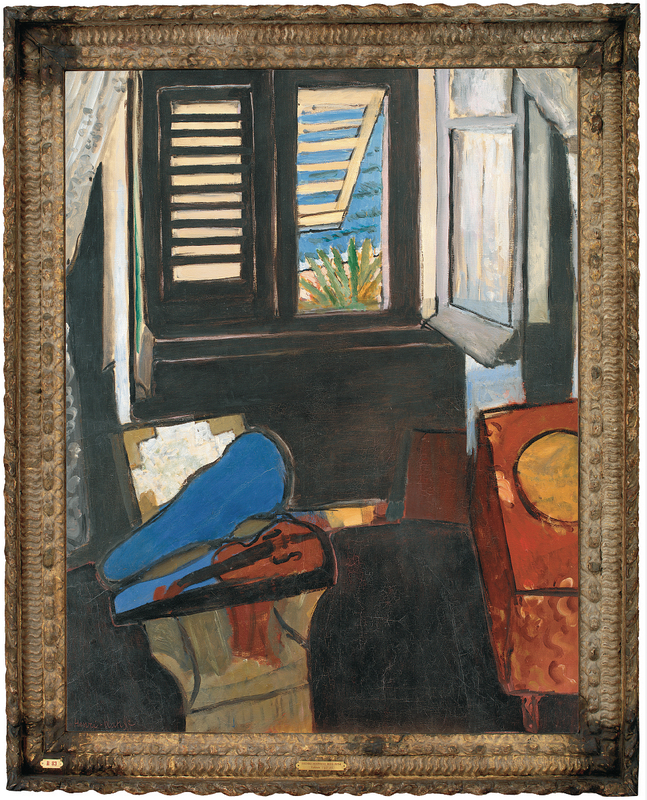 The splendid Mannerist frame with strigillation on Interior with violin deserves a special mention, as it has an expressive and symbiotic relationship with the painting, Matisse having applied black paint to the corners. 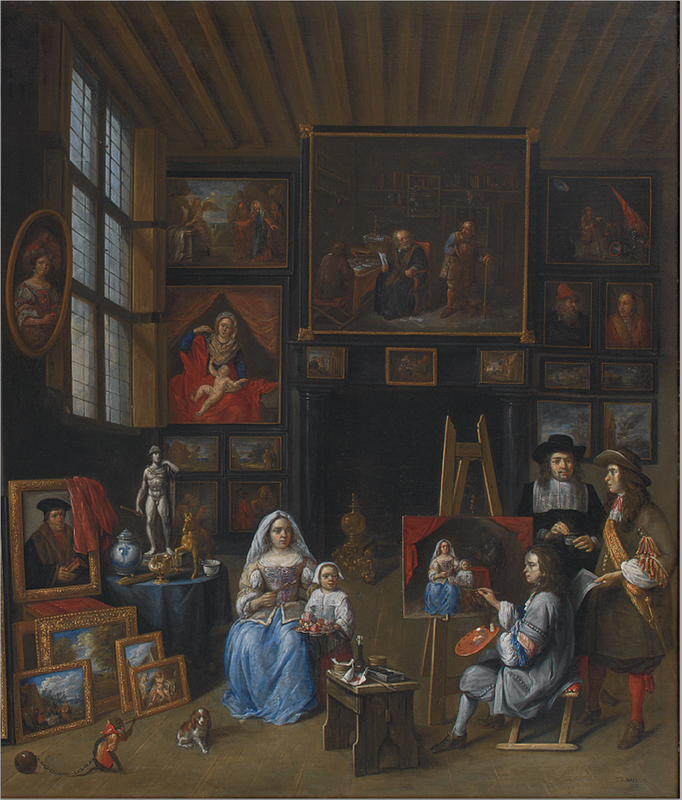 This overview of the Museum’s collection has shown that, while much has been lost in the way of original frames due to catastrophes and neglect, there have also been successes (including, for instance, the recent provision of replica 17th century-style Netherlandish frames for a couple of paintings from the circle of Rembrandt). And there are other interesting collections of frames nearby: an even larger collection at Frederiksborg Castle – which has been little researched as yet – where portraits can be found from the late 16th– late 19th centuries, with good antique frames which often originate from the Royal collections. A similar situation obtains at Rosenborg; and many of the paintings at the Ny Carlsberg Glyptotek and at Ordrupgaard also have fine Italian or French frames. The Thorvaldsen Museum, too, has a good collection of paintings with Italian and Danish frames, illustrating the attitude to framing in the early 19th century. The policies followed by Jørn Rubow in the Museum illustrate the perpetual dilemma for institutions, collectors and interior designers: should frames be contemporary? – should they try to interact with the work of art, or should they be completely neutral? In the course of the 20th century, frames were discarded from much new work; however, this should not govern how older paintings are treated – taste is subjective and changes with fashion, but the expectations of artists in every period should be respected. When reframing has been carried out in the Museum in recent years, there has always been a conscious effort to use designs in the style of the time when the work was created, even when there are budgetary considerations. Henrik Bjerre was Head Conservator & Head of the Jørn Rubow Centre for Conservation at the Statens Museum for Kunst for over 40 years. He curated the exhibition, Frames: state of the art, and edited the accompanying book, from which this essay is drawn. With grateful thanks from The Frame Blog for permission to republish the essay, and to Sven Bjerkhof and Poul Lauritsen for facilitating the process. Lilian Weber, Christian den Fjerdes Farvekammer: ‘Kulturminder’, new series, vol. 1, Copenhagen, 1955. Povl Eller, Kongelige portraetmalere i Danmark 1630-82, 1971, Copenhagen: an investigation of the sources of Karel van Mander’s & Abraham Wuchters’s activities. H.C. Bering Liisberg, Kunstkammeret: Dets stiftelse og aeldste historie, Copenhagen, 1897, 147. Eva de la Fuente Pedersen: ‘Cornelius Gijsbrechts and the Perspective Chamber in the Royal Danish Kunsthammer’, SMK Art Journal 2003-2004, pp.85-107. 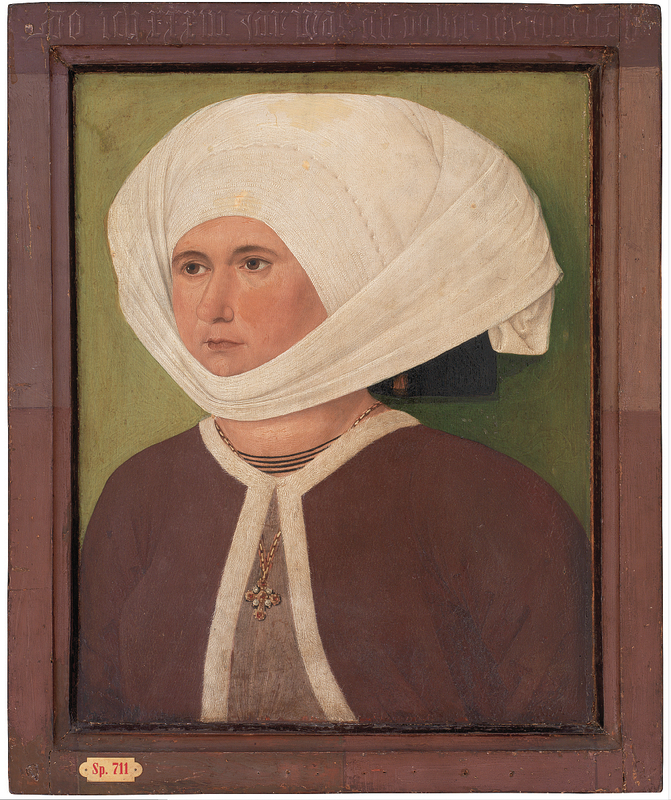 It was the Museum’s conservators who rediscovered Gijsbrecht’s paintings in the 1970s and -80s. In 1971 Steen Bjarnhof and Henrik Bjerre produced the first focused exhibition on one of his paintings in the Museum (KMSsp812). Harald Olsen, ‘Et mallet galleria af Pannini: Kardinal Valenti Gonzagas samling’, Kunstmuseets Årsskrift XXXVIII, Copenhagen, 1952, pp.90-103. Rafaella Morselli, Un museo tra ragione e illusion. La Galleria de’ quadri del cardinal Silvio Valenti Gonzaga. Ritratto di una collezione, Mantua, 2005, p.39. The Portrait of Lorenzo Cybo by Parmigianino had been reframed at the end of the 19th century, on the evidence of an old photograph. This frame was later reduced to the front moulding, in which the painting remained unhappily until the 1990s. The background architecture in Mantegna’s The Circumcision of Christ, part of his Trittico in the Galleria degli Uffizi, Florence, gives an indication of the type of style and decoration relevant to the frames of his paintings. Christian Elling, Christiansborg-Interiører, Copenhagen, 1944, p.22. The drawing is at Rosenborg and, like several other drawings of interiors, is reproduced by Elling among others, ibid., p.58, and (the better version) in Hakon Lund’s Det første Christiansborg. Christiansborg slot, Copenhagen, 1975, I, p.275. On C.F. Harsdorff’s frames, see Tove Clemmensen, Møbler af N.H. Jardin, C.F. Harsdorff og J.C. Lillie, Copenhagen, 1973, plates 62-65. Drawing by Eigtved from Christiansborg, reproduced in Hanne Raabyemagle, Eigtved, Copenhagen, 2007. Niels G. Bartholdy, Paradeslottets hverdag. Christiansborg Slot, Copenhagen, 1975, I, p.377. This type of frame is preserved on Jan Hackaerts, Landscape with bridge. With thanks for the reference to the archivist Steen Nottelmann. Letter from Prof. Vilhelm Klein to Alexis J. Prior, 28 Jan.1908, Copenhagen. A later transcript reads, ‘Enclosed tracings may have some interest for you. They are copies of Bindesbøll (the Elder’s) drawings for frames for Dutch pictures in the Royal Collection of Paintings. Many of them burned at Christiansborg – They are for sale. – Make a quick decision – borrow some money and come to Rome, though best no later than April. Then I will show you the city’. With thanks to Kirsten Vittrup, MA, for the reference. The Bindesbøll frame for the Dubbels seascape (SMKsp503) was later reduced by 6-8 cm each side. A perfect collection of all the historical events ingrained at one place. All the events are primitively constructed and are well proportioned. Thanks for sharing it. It is always a delight and an education to receive these posts. 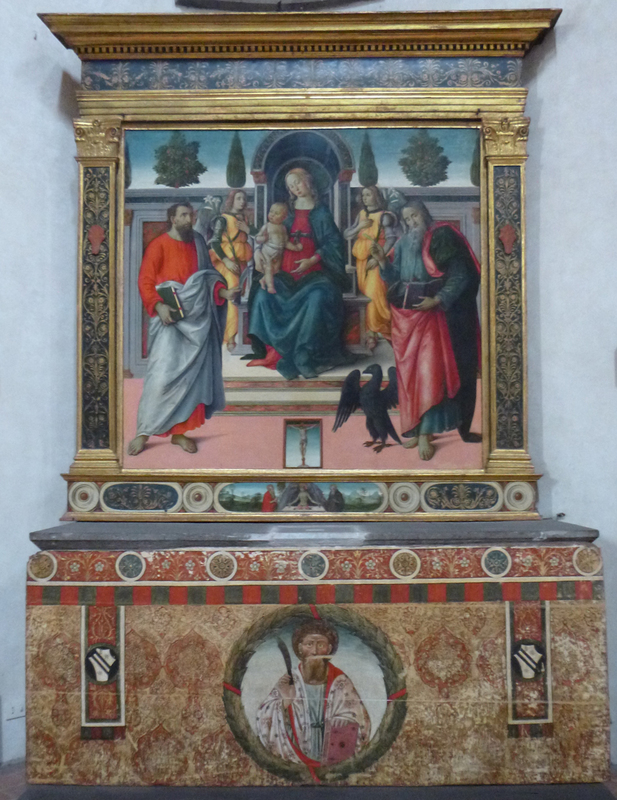 Here, while it is fascinating to see the Mantegna in different frames, it is depressing to hear that the painting has recently been cleaned. When loaned to the National Gallery some years ago its condition was a reproach to those responsible for the condition of the in-house Mantegnas. In fact, it then carried a specific instruction to restorers with eyes to see – someone had over-energetically cleaned Christ’s (true) right foot, rubbing glaze from the adjacent ground and from the base of the sarcophagus, thereby giving the foot a halo. This injury made it apparent that a red glaze had been removed from the stone base. To conceal its damaging consequences, the glaze had been removed not just from the area next to the foot but throughout the entire (visible) middle section of the base. The contrast between this section and the rest was painfully instructive: the marvellous illusion of polished hard stone on the sarcophagus had been achieved with tiny dabs of black and white paint which had been finished with a red glaze. Because the monochrome under-painting showed thus through the red glaze, the appearance of polished stone was wonderfully realized. Thank you so much for your comment, and for such a nice compliment. 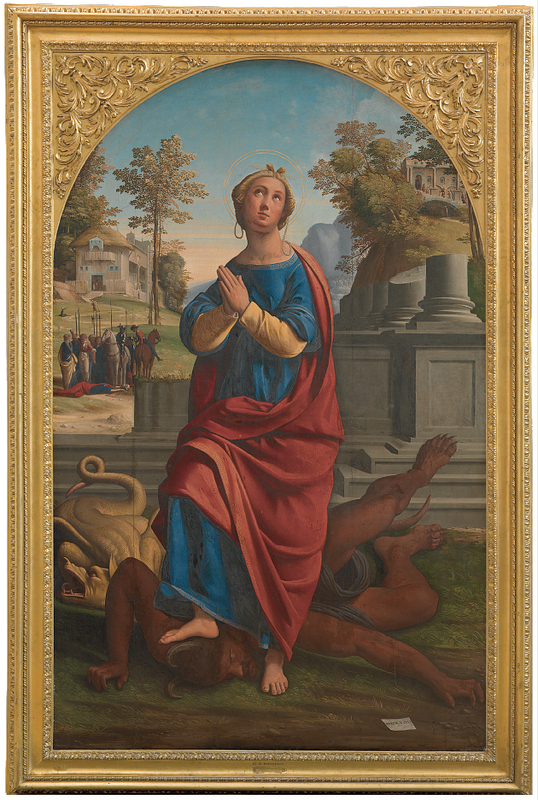 Your description of what has happened to the Mantegna is however very disturbing; the image on the Museum website may be more accurate as to colour (? ), but isn’t zoomable, so I can’t see the base in any great detail. It does, however, seem lighter in the middle section than in the inscribed right-hand corner. Mantegna’s depiction of stone is masterful in all his paintings, so this is very sad. I was pleased to have chance to do so – there are so few blogs that are unfailingly welcome – but I always fear that it looks creepy or condescending just to write just to say how much you like you something. The lost glaze was a shock on the painting because, generally, so much seemed to have survived. I meant to publish something on it at the time but in the days before our website many things never got off the back burner. And you are right about M’s. masterful depiction of stone – funnily enough, in the next AWUK Journal (probably September) we carry a fascinating article on it. I’ll send a copy. The author wrote on Leonardo’s depiction of stone (http://artwatch.org.uk/could-the-louvres-virgin-and-st-anne-provide-the-proof-that-the-london-national-gallerys-virgin-of-the-rocks-is-not-by-leonardo-da-vinci/) for us, so the next will be a prequel. I’m always grateful for any appreciation that might come my way, so thank you again!